The time between each frame is .1 second. Because of the quality of the video used for the swimmer at 90 m and in this analysis, it is only possible to completely view the pull of one arm. Consequently, this analysis looks at Jodie Henry's left arm pull. The 90-m analysis looks at the right arm pull. Ms. Henry's time for this event was 53.84 seconds. Frame #1: The right arm is abducting and presenting its whole surface for developing a large propulsive drag force. The left arm is just breaking the surface as it extends forward. Some observers would claim this position is indicative of a "catch-up" stroke. That would be wrong because the timing/positioning here is not deliberate. As happens with Ian Thorpe and Grant Hackett, the time to execute the extensive effective underwater pull is much greater than that required to recover the other arm. Thus, the recovered arm is "parked" in front of the swimmer while the propulsive arm completes its full application of force. A quick recovery also shortens the time that the arm causes a downward force while out of the water. Some counterbalancing has to be executed to sustain the recovering arm out of the water. The slower the recovery, the longer counterbalancing forces have to be applied. That usually would compromise the effectiveness of the propulsive phase of the stroke. The swimmer's streamline is good. The head looks slightly forward and down. The left leg kicks to counterbalance the resolved force created by the recovering and propelling arms. Frame #2: The right arm has changed to adduction with the upper arm beginning to lose its effectiveness because its angle to the line of propulsion increases as the movement continues. The lower arm and hand are in a very good position for force application. The left arm reaches forward and creates a small downward force to keep the head and shoulders level with the hips. This allows the propelling arm to move backward rather than downward as was emphasized in Inge de Bruijn's stroke at a similar stage of this race. The left leg has kicked and the right leg begins to kick. Frame #3: The right arm continues to press back through extension at the elbow. The "path" traced by the finger tips of the right hand in these initial three frames is almost a straight line, which illustrates the intent of creating a direct line of force application. The left arm is still parked in front. The right foot kicks to counter balance the downward pressure of the left arm. The head is still well into the water. Frame #4: The right arm exits. A bigger left foot kick has almost started to counterbalance the exit. The left arm is mobilized by medial rotation of the upper arm and flexion at the wrist and elbow. Frame #5: A very vigorous repositioning of the left arm occurs. The classic Kieren Peprkins' repositioning movement is demonstrated. The upper arm remains extended forward while the hand/forearm is resituated to eventually become vertical. This is very different to the early abduction of the upper arm used by other women (e.g., Inge de Bruijn, 2004; Jenny Thompson), whom Jodie Henry has supplanted as the world's best 100-m sprinter. The left foot kicks to counterbalance the very fast recovering arm. A faint rise of the head and shoulders is noted. Frame #6: The left arm is in a very strong and effective position. This is a classic movement that is worthy of using as a demonstration. The arm is almost vertical, being totally used as a propulsive surface, and powered by abduction. The trailing drag turbulence off the legs demonstrates how kicking actually creates forces that slow the swimmer. One could view kicking as unavoidable for it allows the swimmer to remain streamlined, the cost of kicking being less than the cost of a non-streamlined body. Frame #7: The left arm propels the swimmer forward by adducting the upper arm. The left elbow is bent to place a considerable portion of the arm more toward the centerline of the body. The right arm has entered, but is not evidence of a catch-up stroke for the reasons outlined above in the explanation for Frame #1. The head begins to rise. The left leg prepares to kick. Frame #8: The left arm is fully adducted and the forearm/hand remains vertical, exemplifying the efficiency of this swimmer's propulsive action. The right arm remains extended forward (parked). The right leg completes its kick and creates a braking force. The reason for its occurrence is not clear, but it most likely has something to do with the rising head, which is starting the breathing movement. The left leg begins to kick to counterbalance the downward force of the right arm and the upward force created by the exiting left arm. Frame #9: The left hand has "rounded-out" and left the water. The left leg has kicked vigorously and turned the left hip upward. That action reduces the amount of lateral movement required for the left hand to clear the hip and thigh at extraction. The right arm presses down. The head is lifted and turned to the side before inhalation. The swimmer has lost noticeable streamline. Frame #10: The right arm continues to press down as inhalation occurs [perhaps the swimmer should have attempted an earlier inhalation]. Some bend occurs at the right elbow. The right leg prepares to kick. Frame #11: Inhalation is almost complete. The right arm is being repositioned to propel the swimmer. Abduction of the right upper arm has begun. The right leg has kicked. The left leg is poised to kick. Frame #13: A position after that displayed in Frame #1 is attained and the stroke cycle begins again. This analysis of Jodie Henry demonstrates her excellent right arm set up followed by a full-arm direct propulsive action. 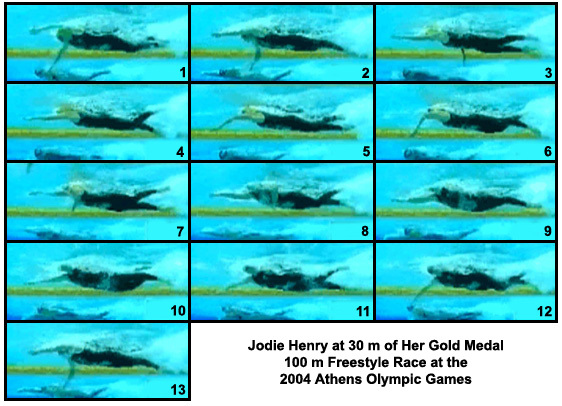 Along with the analysis provided of Ms. Henry at 90 m of this race, a reason for her excellent swimming is displayed. The mechanics of her propulsion are very impressive.